That’s where you come in. Just sign the contract, and you gain unrestricted access to a Corp Inc. Warehouse. Build your own space ship from the available prefabricated components, and fly it to the Periphery. Of course, you may have to eat a loss, but any profits you make along the way are yours to keep, and Corporation Incorporated will pay you a bonus for quick delivery. In Galaxy Trucker, you play the role of a trucker who is being paid to haul a literal pile of junk across the galaxy. However, you’ve come up with the brilliant idea that rather than throwing all the junk into your “truck” and carrying it across the galaxy, it would be much easier and more cost-effective to just build a ship out of the junkpile and fly that instead. In the first phase of the game, there is a large pile of tiles in the middle of the playing area, all turned facedown. Someone shouts go and everyone madly scrambles to bring a tile back to their player board, flip it over, decide whether to use it or throw it back, and repeat. It can be a lot of fun to steal the perfect tile right out from underneath your opponent’s nose (of course, they might return the favor next round). Players are trying to fit as many lasers, engines, shields, batteries, cabins, and cargo holds onto their ship as possible, but they only have a limited amount of space and they have to make sure everything properly connects. When someone finishes building their ship, they flip over a timer and the remaining players only have a limited time to finish building their ships. Now that the ships are built, it’s time to fly them across the galaxy, but that is no simple task. Along the way there are abandoned ships and stations, smugglers, meteors, pirates, slavers, combat zones, and a great deal more. They come in the form of cards that are chosen randomly from a deck. In round 1 there are 8 cards, in round 2 there are 12, in round 3 there are 16 and the difficulty of the cards increases with each round as well. Most of the cards will reward you with goods and money if you manage to defeat them, but if you fail, odds are you will lose a tile from your ship. It gets worse, if the tile you lose is the only tile connect a section of your ship to the main part of your ship, you lose that entire section. Once you make it through the cards, you land and score points for the order you landed in as well as any cargo you may have accumulated along the way. Now you get to do it all over again with a slightly larger ship. And then again in round 3 with an even larger ship. However, since the junkpile that you are building your ships from is the same size every round, but everyone is building a bigger ship each time, you quickly learn that you’re going to have to settle for less quality components in the later rounds. Once all three rounds are completed, the player with the most money wins. One aspect of this game that is different from many Euro-games is that there is almost more skill involved than strategy. When building a ship, it helps to be able to look at all the tiles that have been flipped over, both by you and your opponents, and be able to see which tiles will best fit your ship. You could strategize all you want, but if you aren’t quick and able to see that the tile you need is sitting in front of your neighbor, you strategy will do you no good. Verdict: Because there is a fair amount of skill in this game, veteran players will almost certainly do better than most novice players. However, even if you aren’t able to build as “good” of a ship as your neighbor, it’s still a lot of fun to go through the process and watch as the cards wreak havoc on everyone. Who knows, maybe the more skilled player will lose half his ship when a large meteor strikes him from the side and you will swoop in to steal the victory from him. Pros: Gameplay is extremely fun for new and old players alike. The game is humorous and the rulebook is well-written and funny. Cons: There is a learning curve, but after a couple games, everyone should stand a fighting chance. I’ve played numerous games of GT and always enjoy the fun time had by everyone. Don’t let the cartoonish style of the components and rulebook fool you though – this game, while simple to pick up, can be vicious. In the first phase, you’re racing against all the other truckers trying to build your ship with as many engines, lasers, shields, and crew as possible. Oh, and don’t forget the fact that there are different types of connections for each piece and if your connections don’t match up, that tile (and possible other pieces attached to it) fly off in the infinite void. Of course, this costs you money because the corporation is fickle like that. Once everyone’s ship is built (each turn of the game requires a more complex ship) and all errors are accounted for, then the second phase begins with flying the ship through space to your destination. This is simulated by flipping over cards from a deck and dealing with the various issues that arise. Problems you may encounter range from incoming asteroids (better hope you have lots of lasers and shields), space pirates, salvage, space dust, and open space (fire up the afterburners, baby!). After everyone arrives, you tally your payload, subtract any lost parts from you income, and start over with a more complicated ship. At the end of three rounds, whomever has the most money wins. The quality of the components is very good. Even after numerous plays, our game still looks to be in great condition. The cartoonish theme is consistent throughout, and the variety of pieces (such as glass beads for batteries) are a nice touch. It’s been quite a while since we’ve looked at the rulebook, but I believe that the rules were pretty clear. In fact, the rules are laid out in a way that they want you to learn the rules for building the ship, play that phase, then come back and learn the rules for the space flight before playing that phase. This works out well as it allows everyone to get in to the game quickly before the dreaded Rules Overload and Glazed Eyes kick in. The game seems mostly fair. It does tend to favor those who can look at tiles and judge quickly whether they will work with the current ship parts and where to ideally place them. This can lead to quite a bit of fun as players become more desperate as those critical pieces get taken. It also leads to some really crazy ship layouts. However, with the chance element when it comes to certain aspects of the space flight, as well as the general luck of finding a specific tile, this skill isn’t overpowering or a guaranteed win by any stretch. Overall, I think this is a great game. The only thing I can think of to improve it would be a greater variety of cards. Depending on a shuffle, you can easily come up against something you’ve seen before. But this is a minor quibble since the variations in the ships from game to game can greatly change how difficult a given card may be. Galaxy Trucker is a game designed mad genius Vlaada Chvatil in which players take on the role of intergalactic truck drivers. It’s basically Alien the movie without all the horror and Aliens bursting out of peoples stomachs and Sigourney Weaver in her underwear. But before players start driving their space trucks, they have to build them. Each player has a board on which they build their ship piece by piece. In order to be a functioning ship you need various things: engines, crew cabins, cargo holds, and lasers. Each component of the ship allows a player certain benefits during the remainder of that round, and if that were all there was to it then it would be easy to make your way across the galaxy. But their’s a catch; players have to build their ship… as fast as they can! Your first ship is likely to look like the pipework under your house and fly just as well. Once everyone has built their ship you will take these puppies out for a test drive. The first round will be pretty easy. If your lucky, you might just make it to your destination with a little cargo and more than half your ship. You see, as you fly about you will run into pirates and asteroids and various other things that will cause damage to your ship. The ship is connected in such a way that if certain parts of it are hit you may lose everything but an engine and a cargo hold making your ship the equivalent of a motor scooter. This madness, this loss of everything you built is what makes this game so much fun. If that were the entire game it would be worth playing. It’s what happens next that makes it a work of art. Once your first ship has been dropped of you build a new one, and this one is bigger than the first and more bad stuff will happen. Then it happens again. At the end of the game you’ll feel lucky to have any points at all. If that weren’t enough the game comes with advanced boards, and the opportunity to lose absolutely everything. There isn’t a game out there that is more fun than Galaxy Trucker. My only complaint is that it only plays 4 players, something which is solved by picking up.. The Big Expansion (yes, that’s really what it’s called). Congratulations on your assignment from Corporation Incorporated! We need you to build a ship as quickly as possible, find some stuff out in space, and deliver it on time! So many people think of space travel as some glorious occupation in a ship filled with comfort, holodecks to relax in, plenty of room to kick back and just do what needs doing, exploring the galaxy. But, even in the future, people want stuff. People NEED stuff! How do people GET this stuff? Well, in the future, they will get it the same way they do now; from the backbone of civilization that is the long road trucker. Alas, there is nothing glorious about the life of the long road trucker. We cuss at them for going too slow and forcing us to pass them. We ride in their draft to save some gas mileage, not being able to see their mirrors and knowing **** well they cannot see us, but they know we are there, using them. Long lonely days and nights, greasy nasty food at truck stops… Now, lets add the perils of space to this life, and the requirement to build your long haul spacecraft from scratch in a matter of minutes and hope you don’t screw it up, and you have the beginning of Galaxy Trucker. Galaxy Trucker is a game for 2-4 players. The goal for the players is to have the greatest amount of cosmic credits at the end of the game. This is not a combat game, but more of a race. Your greatest enemy is the events that crop up, and yourself, depending on how well you build a ship under pressure. OK, we have stuff, what do we do? 3. Place it, face up, on the corner of your board. You may do this with no more than two components at a time. Once you do this, you are committed to using this tile. Should you fail to do so, it will count against you at the end of the round. Once a component is placed on the ship, it cannot be moved or rotated. You are committed. This continues until someone has completed their ship. This player will take the token numbered “1” and then turn over the timer (when it is empty) and place it on the “Start” area of the flight board. Everyone else now has until that timer runs out to complete their ship. If you launch and find out you forgot engines, you are hosed. If you do not have enough astronauts (two per living quarter) you will not be able to complete certain adventures. Wanted to bring an alien? (they give bonuses to engines or laser power, depending on which ones you bring) You better have the proper life support module attached directly to a living quarter for them to live in. No lasers? Hope you don’t see any meteors or smugglers. No shields? Ditto. So, obviously there is a lot to consider in the short time you have to build. Yeah, it is more complex than that. Each component has one of three different connector on it. One is universal, so it can connect to either of the other types, but if you accidentally connect a double connector to a simple connector, things will go badly for you. In addition, you cannot have a laser with any other component directly in front of it (although you could have one two spots away, just figure it is three dimensional and it makes sense) nor can an engine have anything directly behind it. In addition, all engines must point backwards. Lasers can point any direction, but in direct combat scenarios, they only count for half if not facing forward. However, should something threaten the back or sides of the ship, and you have no laser pointing that direction, you may have a problem. Shields can protect basically two sides of a ship, depending on how they are placed. They could do, say, the left side and back if facing downward left, or the right and front if facing those directions… Just make sure your design included some batteries, or that shield is completely useless. Same goes for double engines and double lasers. These are more powerful, but do nothing without batteries to power them. Alright, so, time is up, and your ship is complete. Time to get some cargo and some profit! Not so fast… Time for a spot check! You and the other players are going to look over your ship and each others ships to see if every connection is legal. Should you have connectors, say, a double to single, for instance, things start falling off your ship. Anything that is connected to an illegal connection that is not legally connected elsewhere just falls right off. If you were not careful, you could have a quarter of your vessel disappear before you get underway, along with any of the critters, engines, shields, etc. attached to them. This will happen occasionally. There is nothing stopping you from leaving exposed connectors on your ship, but there are penalties for doing so. For instance, when you encounter a meteor storm adventure card, small meteors can be ignored if they hit a smooth side of your ship. However, should they come into contact with an exposed connector, that piece of the ship is destroyed. Hope everything else next to it was attached to something else on the ship! In addition to this, stardust, when encountered, will slow you down by causing you to loose a flight day for every exposed connector. The player with the best looking ship at the end of the round (the one with the least amount of exposed connectors) gets a bonus, so there is another upside to create a complete ship. During the course of the game, once ship building is out of the way, you will move along the flight path based upon your engine power, which is determined by number of engines, brown aliens augmenting them, and double engines you choose to power. The lead player gets many perks. They often get first crack at adventures that are encountered to find goods and credits, get the chance at the best stuff planets have to offer and get the largest bonus when reaching the end of the round. This does not necessarily mean the fastest player will always win, but it sure doesn’t hurt. You will sometimes encounter abandoned ships and space stations, which you can spend astronauts and flight days, which cause you to move “x” amount of spaces back. These will often give you additional cosmic credits and sometimes goods. Planets take time to land on and barter with the inhabitants, but are a great way to load cargo on your ship. Often there are only two or three spots to land on, however, so if you are lagging behind, you may get left out! When encountering the scum of the galaxy, being first could be a detriment, provided you don’t have the firepower to take them. The bad guys will attack each player in line, until someone takes them out. If you cannot, you may loose crew or goods, or they may blow up parts of your ship. Meteor storms can harm parts of your ship (based upon a die roll) Should you be unable to stop the meteor, say goodbye to parts of your vessel. There is more, but I think you get the idea. Once you get to the second round, you get a larger ship template, and the time goes through an extra step, giving you more time to complete the ship. The same thing happens on the third and final go-around. There are also more perils each round, so it is more important as the game progresses that you be a good ship builder, timer or no. At the end of the day, this game is all about the ship you build. Every game is going to be different, so there is plenty of replay value here, and I will admit, I see the humor in watching parts of my ship crumble because I made a mistake when building it, and, even more so, I see the humor in it when it happens to someone else. When things go badly, you can get a bit frustrated at yourself, but the quality of the ship was always in your control, so you never have the game to blame. When things go right, I tend to feel mighty good about myself when blowing a pirate out of the sky with my superior firepower or shooting into the lead through open space with my engine-filled vessel. So, is the game worth a purchase? I have to admit, I do not own it. A friend of mine has it, and it is a blast to play when he pulls it out. However, $75.00 is an awful steep price of entry here. I cannot tell you what to do, but I can say everyone I have played with enjoys the game, and there is never any groans when it is suggested. A puzzle game that makes you build a spaceship-trucker and then take it to a crazy travel where it may be destroyed… or not. Phase One: The play is simultaneous. Choose tiles that represent various parts of a spaceship (cannons, engines, cabins, cargo, energy, etc) and put them on your spaceship board. In this phase you can also take a look at the cards that represent most of your future travel. Phase Two: The travel cards are shuffled (after a few new ones are added to the deck) and turned one at a time. The players must react to the events in order to avoid damage to the spaceship and to collect goods from planets, smugglers, abandoned space stations, etc. After three or four rounds, the player with the most space credits is the winner. Credits are earned in several ways: order of arrival at the destination, “better” spaceship, delivering goods, letting some of your astronauts go away in an abandoned spaceship, etc. In phase one you must decide how to build your spaceship and build it quickly! You may take a look at the travel cards to get a general idea of what you will face in the future. Also, look at what the other players are doing, because there are cards that will hurt a lot if you have the least number of something (people, cannons, engines, etc). In phase two you must decide what engine, shield or cannon to activate and if you lose time to get those profitable goods. It is really fun to build something that works and reacts to events. After a few plays you will know the tiles and will be able to build better spaceships in order to avoid or minimizing damage. You may not like to see your pretty baby being destroyed by meteors or enemy spaceships. Also, experienced players will get a huge advantage but this can be fixed by the handicap/advantage cards included in the anniversary edition. You may feel like an engineer that must build a spaceship according to incomplete specifications. And if you have a certain sense of humor, you may laugh a lot seeing your adversaries’ spaceships being destroyed along the way. Ok, I lied. Not a one word, but it goes down to one word in the end. Please stay and let me take you for a quick trip on my space truck ship. Me, sweating – Ok, two more tiles… come on, come on. Where are all the batteries? – quick glance over at my wifes ship – Of course! As always she’s ‘collecting power’. Let’s put this gun here… and… faster faster faster!!! and one more cabin. DONE! Smashed the hour glass on the Start! Phew… let’s check the connection. All fine. Ha-ha! Sorry honey, this does not fit where you put it. What? You’ve lost your whole left wing because of it? I’m so sorry for your loss. Ok, small meteor hiting on… 5… oh come on! The only open connection that I had!?.. no batteries for shields, great – removing the tile – good that I’ve double connected this side of the ship. Next card… Pirates? Just great, I lack one firepower – some die rolls, removing another two tiles… and a whole right wing just fell off my ship. My wife – I’m so sorry for your loss honey. Sounds like a madman talk? Well this is how this game goes. Fast and furious. First part is crazy speed tile laying and building up your most unusual space ship. There will be no Enterprises nor Galacticas. There will be pipes sticking out, guns in every direction, shields hopefully covering different sides of the ship. Anything that can be attached is good. It all with the competition (that means other players) taking parts you needed just when you were to grab them. In the end you will have your ship like thing and will fly to grab the riches. Second part is where you will fly and … did I say grab the riches? Well maybe more like… try to get to the end? Your ship will get hit, sabotaged, smashed by meteors and once again hit. Sometimes you will get some goods, but most of the time you will get punished. The good part is that everyone will get smacked. This is as fun as the first part, what may sound strange, but it is. Everything will blow up, your ship and the ship of the others, more often then not, will not even be closely similiar to what they were at the beginning. Some will not even finish the trip. And then you will do it again. Build another ship, just bigger and take it on a longer, nastier trip. And then for the third time. After that who managed to earn the most money is the winner (yes there is a goal in this madness), but the truth is… everyone is a winner in this game, because they had extreme fun. If you could find one word to describe it, it would be fun (ha ha! – here it is, one word review). This is not the best game ever designed, but it is for sure one of the most enjoyable. This is 10 out of 10 on wacky entertainment scale. For me this is a winner. Nothing really new to say, but we’ve been having a lot of fun lately since the Missions expansion came out and I felt like promoting and piling on. One of the most fun gaming experiences with every sitting. The new Missions expansion has re-energized our group for this chaos game. The first part is an enjoyable exercise in building and planning. the speed element adds tension and can fluster some folk. The 2nd half, the Flight, is always a chaotic, often hysterical race to see who’s carefully constructed starship will be blown to smithereens the least/best. But it isn’t just a sit-back-and-let-the-fates-whack-you-with-adventure-cards thing. There are important decisions to be made at every turn (whether to sacrifice crew or wait, to land for cargo or race to front, spend the batteries now or save for later, etc). And when the USS Enterprise-shaped ship has it’s single connector neck piece obliterated by Sabotage or the Pirates’ lasers, leaving that player to decide which half of their ship to leave behind, their opponents will always moan in sympathy (or raucous laughter and high-fives, the schadenfreude is real). Approached with a light heart and good sense of humor (and expectation of losing, perhaps spectacularly) and this Vlaada game is tough to beat for an hour or two of ridiculous fun! “Corporation Incorporated is an interplanetary construction firm that builds sewer systems and low-income housing on the less-developed planets of the Galaxy. For years, Corp Inc. has tottered on the brink of bankruptcy: transporting building materials to the edge of the Galaxy, where the need for their services is greatest, is a risky business. Yup! You get to build a spaceship out of sewer pipes, and then fly it across the most dangerous reaches of the galaxy, risking life and limb, to possibly become very rich. Or, as is more likely–To end in a deep well of debt–If you don’t get killed by meteor swarms or kidnapped by slavers. Galaxy Trucker plays in two phases. In the fist phase you build your spaceship–placing things like cannons, engines, and cargo holds on a ship mat. Then, you fly that ship through a series of adventure cards, picking up goods, dodging fire from pirates, and looting derelict space stations on your way to whatever backwater planet you’re going to. Then, you do it again with a bigger spaceship. And again, with an even bigger spaceship. This bit is where all of the players are hanging out at one of Corporation Incorporated’s warehouses, filled to overflowing with sewer parts that have been modified into spaceship parts. All at the same time (no turns here, folks. It’s like Black Friday with spaceships, and without the trampling and pepper spray) you will flip over component tiles, find the ones you want, and put them on your board. During this time you can also get an idea of what you’ll be facing–adventure cards are divided into 4 piles before building starts. After you place at least one piece on your ship you can look at 3 of those piles. Keep in mind that you only have a few minutes to find everything–you have a schedule to keep. You have to follow rules, of course. Components can only connect to each other if they have the same kind of connector, engines can only point backward and can’t have anything directly behind them. Cannons can point any direction, but can’t have anything directly in front of them. You can have exposed connectors, though–bits of pipe just hanging off the side of your ship is okay, it just makes it more likely for your ship to fall apart. When you decide that your ship is done (or the timer runs out) you grab one of the player order tokens, buckle up, place all your crew and battery tokens, and leave Atmo in a blaze of blazing afterburner fuel. Now you get to see whether or not your ship is any good. In the first round there are 8 adventure cards to go through. Some of these, like the enemies pictured above, and bad. Others, such as abandoned ships and fruitful planets, are good. If your ship is good enough, all* of the cards are good (you get money and such for shooting down pirates). *Okay, not all of them. Meteors and Epidemics are still bad, but maybe they won’t hurt you. You shuffle all 4 piles of cards together and then flip them over one at a time, doing what they say before flipping the next one. After all 8 cards are gone through, players get extra money depending on how they placed (Corp. Inc. discovered that making it a race is a great way to get their goods to arrive on schedule, and so you get more money if you get there before anyone else). The player with the best-looking ship (the one with the fewest exposed connectors) also gets a bonus. After that, everyone sells the goods that they picked up from planets, defeated smugglers and abandoned stations, and you start round 2 with a bigger ship. After 3 rounds (or more, if you want to play with both a Class III ship and a Class III A ship ((Or more, if you have expansions (((Classes I A, I C, II A, II B, II C, III B, III C, IV, and IV A are the ones that currently exist))) )) ) the game is over. Everyone counts up how much money they have, and the person with the most money wins. 3 types of connectors. Pieces with green on them require batteries. Engines go backward. If there’s a tie, the stuff happens to the player in front first. It’s still a lot to remember, especially for young players–9 someodd types of components, 8 types of adventure cards, cannons pointing sideways only count as half as strong… But you get used to it all after a few plays and it just becomes second nature. Galaxy Trucker cards are actually not the best. They look fine and work fine, but they feel a little thin. That said, my cards are still in great condition and I don’t expect them to wear out any time soon. Little aliens with no faces. Little astronaut dudes with no faces. Blocks of goods. Even though there isn’t much detail, the pieces are still solid. The only ones I am really ever worried about are the batteries–I keep being afraid I’m going to loose them. Vladda Chvatil has pretty amazing rulebooks. Humorous flavortext spread throughout (My two quotes both come from Galaxy Trucker’s rulebook), and examples, diagrams and explanations that cover every single possible question. This is a nice rulebook. $50 for one of my most played games. That’s pretty good. Your strategy is largely the same every game you play: try to build a well-rounded ship that won’t fall apart. The time limit and other players are what makes that difficult. For a class I ship you have 17 spaces to place components and 144 components through which to dig to find the pieces you want, with a minimum time of 3 minutes (the last 90 seconds only starts once someone has finished their ship, so if no one has finished yet, you have more time). Add to this the fact that 17 spaces is not enough to get everything you need on your ship (for example: 6.5 cannon strength to fend off the pirates ((and cannons pointing every direction to destroy meteors)), 2 shields, enough cargo to carry all the goods you’ll pick up, enough crew to loot abandoned stations and pilot home abandoned ships, and more engines than everyone else. 17 spaces. Good luck). Also, the other players are taking the pieces you want. 8 types of cards, but each individual card is different than the others of it’s type. 60 cards total, with 20 for each round. Build a well-rounded ship. There is some strategy in when to use your batteries, but not a whole lot. Galaxy Trucker becomes much more strategic when you add in the expansions. The easiest (read: only) way to teach this game is to play it and watch the people who are learning die. There is simply more to building a good spaceship than most people can grasp by reading the rules. Other than that, it’s pretty simple. Not much, except to laugh when other peoples’ ships get blown apart. Still, this leads to a pretty easy social environment. I would say that Galaxy Trucker is one of the more social games I own. Galaxy Trucker stories are sometimes fun to tell, but every story is the same, so it gets a little repetitive. You play as nutcases flying through the most dangerous sectors of the galaxy in a spaceship made of sewer parts and cheap housing. If you build you ship well, it doesn’t feel too much like that; but a ship that is not built well definitely feels like that. Building your own spaceship very much puts you into the science fiction theme. I might even say that it is my favorite part about Galaxy Trucker. I have yet to find any other game that really lets you build a spaceship. I’m not even going to both breaking this up like I usually do. The rules are fantastic. Every possible question is answered. The layout is wonderful. Every player is doing the same thing, from the same pool of components. There is a strong advantage to experienced players however, and without expansions I haven’t found an easy way to get rid of that (you can do away with the time limit, but that doesn’t help enough). Galaxy Trucker is a fine game, and one that I would recommend to most people. If you don’t like it, I will buy your copy from you and make an entire fleet of spaceships*. *This is not a legally binding statement. Galaxy trucker is the latest game to my collection. When I bought this game I went blindly on others opinions and it sounded like a game that would be great fun to play. Boy was I right. Galaxy truckers is a game that will have you and your friends rolling at the floor laughing as well as crying when you see what the space travel portion of the game has done to your wonderfully built ship. The game is simple to learn and great fun to play. The build phase has you and your friends scrambling to grab parts and place them on your ship. The faster you finish your ship the sooner you get to go. It is great to be in the middle of building your ship and hearing one of your buddies cursing at the pieces he is getting as he realizes that he cant place it on his ship. Also the game makes great use of a timer to let you know that time is not on your side when it comes to building your ship. The flight phase of the game is usually where other reviewers have said that is the low point of the game but I actually enjoyed shuffling the cards, dealing them out, and flipping them over one at a time to see what dangers awaited us. Hands down this game is quickly becoming one of my favorites and look forward to purchasing the expansions to this game soon enough. I thought I was getting an ulcer the first time I played this. Trying to get everything we’ll placed and covering all the bases was almost a futile effort, but in the end it didn’t matter because playing this game is less about winning then it is going on an exciting journey with your friends. Here’s a tip. If you are OCD, you should probably stay away from this game. The most fun part is of course seeing whose ship survives, or at least partially survives, the trip around the galaxy. The best laid plans can be all for not depending on how the cards fall, but that’s not to say that you shouldn’t try to build the best ship and the more you play the better your ships will get. Just don’t get attached. I love the layout of the boards and how each round your ships can get bigger. The tile art adds a unique style to the game that stands out for sure. Everyone that plays this, thinks it’s a so much chaotic fun. Good times for sure. Expensive game tho. keeps me from owning. Sometime i’ll find a nice used copy. 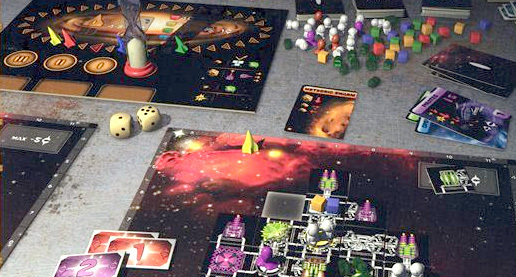 Add a Review for "Galaxy Trucker"